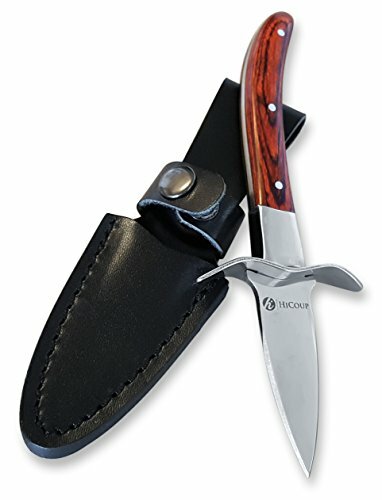 Mirror finish stainless steel blade - Using only 420-stainless steel, this artisan made oyster knife features a "full tang" mirror finish blade that is securely held together with 3 strong rivets that have been compression riveted to the beautiful pakka wood handle. The thick reinforced high-carbon stainless-steel blade has the perfect rigidity and width to powerfully slip between the oyster shells' to open them. Pakka wood handle with hand-guard - We know how important handle design is in an oyster knife. Our beautifully finished pakka wood handle fits comfortably in your palm and offers a skid free grip allowing you to safely open oysters even when your hands are wet. As an added safety feature, our oyster knife also boasts an oversized hand-guard that will protect your hands from the oyster if the knife slips during shucking. Durable and compact design - Measuring 6-1/2 inches from tip-to-tip with a 2-1/2 inch blade, this one-of-a-kind oyster knife is incredibly durable and feels great in your hand. It is compact enough to handle small oysters yet sturdy enough to tackle large ones. The knife is light and comfortable with a simple design that enables even first timers to efficiently open everything from chestnut-size Kumamotos to 4-inchers from Martha's Vineyard. 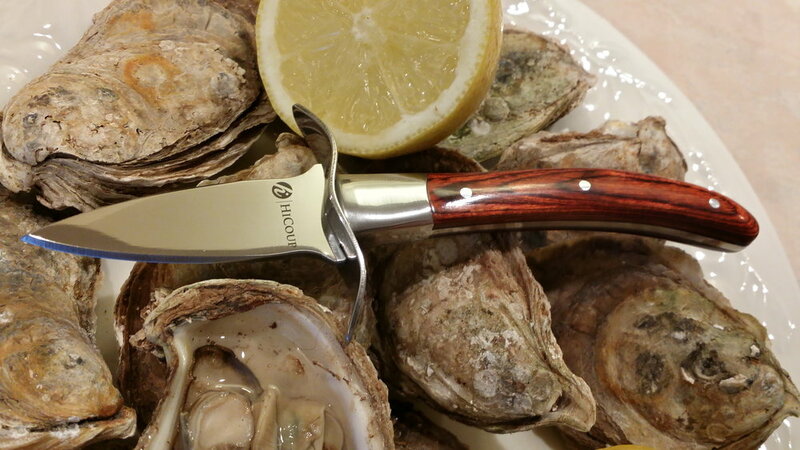 Great gift idea - Our signature oyster knife looks fabulous on a shelf or on a kitchen counter-top when it is not shucking oysters and also makes an impression as gifts for weddings, groomsmen, golf tournament, corporate affairs or donor appreciation events. 100% customer satisfaction guarantee - We know that an oyster shucker knife is a specialized tool and are very dependent on personal preferences. That is why you can shop with confidence with our 100% CUSTOMER SATISFACTION GUARANTEE and LIFETIME GUARANTEE. If something breaks or if you don't absolutely love your new Oyster Knife, we will take it back and offer a replacement or refund, no questions asked. That is part of our 100% LIFETIME MANUFACTURER'S GUARANTEE! !